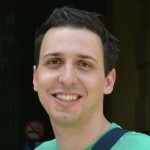 Bernd Ploderer is a Research Fellow at the University of Melbourne, Australia. His research interest lies in the potential of social media to support engagement, learning and behavior change. He works with Wally Smith, Steve Howard, Jon Pearce, and Ron Borland to design an interpersonal informatics system to help people quit smoking. In this research project my colleagues and I are trying to design an interpersonal informatics system to help people quit smoking. Previous studies show the various benefits of such systems for helping people to change their habits, like the ability to learn more about personal habits, to reflect on them and to develop strategies to change them. These systems can also enhance the awareness of how people around one influence one’s habits, and some people derive motivation from cooperating with others in the same situation. However, previous research also points out that many people are reluctant to share personal information via interpersonal informatics systems due to privacy concerns. Hence, before we started our development we conducted a study to explore this ambivalence about interpersonal informatics systems. Rather than indifference, ambivalence connotes strong simultaneous conflicting states, in this case both a desire to gain the aforementioned benefits of interpersonal informatics systems as well strong concerns about potential risks. In our study we used a prototype of a smoking cessation application to unpack these conflicting states about collecting, sharing and reflecting on personal information. We invited twelve people (six smokers and six people who recently quit) for an interview. We used screen mock-ups of a fictitious mobile and social smoking cessation smartphone service called Consider Quitting (CQ). CQ is designed as a smartphone application. 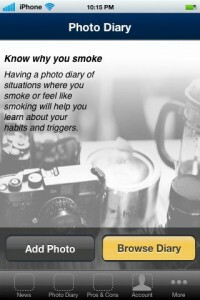 It allows smokers to take photos of the things, people, places, and activities that trigger their smoking. 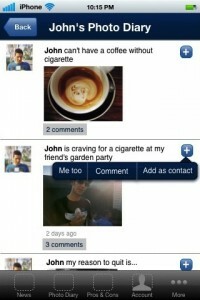 These photo diaries can be shared with other users of the service. People can browse through the photo diaries of other users to further explore their triggers for smoking, to initiate connections and interactions between users, or simply to get inspiration for their own quit attempt. Our findings point out a number of different tensions that contribute to their ambivalence about CQ. Ambivalence about behavior change: Smokers (and ex-smokers) are ambivalent about the behavior change itself. Every participant wanted to quit, but at the same time they also expressed a desire to continue smoking. Ambivalence about sharing personal information: Several participants had seen friends post about their quit attempts on Facebook, yet they were reluctant to do the same about their own quit attempts (neither on Facebook nor on QC). Some participants were generally concerned about sharing personal information online regardless of the content; others were specifically concerned about sharing information about their desired behavior change because of the added pressure from committing to other people the and risk of failure and losing face. We are currently analyzing the data in further depth to develop our understanding of the different sources of ambivalence and their interrelationships further. In future work we aim to deploy prototypes to develop a dynamic understanding of ambivalence, showing how different aspects of ambivalence ebb and flow in their influence over smoking cessation. In this workshop we present our current analysis and discuss ideas for prototypes to address such an ambivalent state to help people quit smoking. This article is a summary of a position paper by Bernd Ploderer and his colleagues that will be discussed at the Personal Informatics in Practice workshop at CHI 2012 in Austin, TX on May 6, 2012. The workshop will be a gathering of researchers, designers, and practitioners exploring how to better support personal informatics in people’s everyday lives.